Deer are the plague and frustration of many an area homeowner attempting to landscape their yard. Oh, the sorrow of the lush hosta eaten down to stems and proffering all the allure of a bunch of celery sticks stuck in the ground. The good news is that there are plenty of deer resistant plants out there for local gardeners to use in their landscapes. Here are some of the best flowering plants for our region that deer usually avoid. For Sun: Use marigolds, annual lantana, angelonia, bacopa, Blue Daze evolvulus, cleome, vinca (Catharanthus), flowering tobacco, ageratum, salvia/sage, purple fountain grass, melampodium, fanflower (Scaevola), and zinnias. All of these will provide a bonanza of color in your garden and most come in several colors. For Shade: There aren’t that many deer-resistant flowering annuals for shade, unfortunately. Try blue (or white) lobelia. This is the L. erinus species. I like the Techno Heat series that copes well with our summers. Others to grow include Mona Lavender plectranthus, forget-me-not, and foxglove. Foxglove, technically a biennial, does not bloom for a long season but the huge, pastel spikes of tubular flowers are exceptionally beautiful and worth planting. Perennials typically live several years, more or less, in the garden saving you time and money. Their bloom times usually range from two to four weeks, and some will bloom more than once. For Sun: ‘Ms. Huff’ lantana, ‘Ham ‘n Eggs’ lantana, and autumn sage (Salvia greggii) are favorites to recommend since they bloom for as long as annuals do – from spring to frost- but come back year after year. Plant the lantana in spring since it isn’t as cold hardy when planted in fall. Other great contenders include iris, gaura, yarrow, false indigo, blue star (Amsonia), hardy sunflower (Helianthus), and catmint. For Shade: Plant bleeding heart, celandine poppy, barrenwort (Epimedium), ferns, foamflower, and Lenten roses. Most of the blooms in the list occur in spring. For some reason, there aren’t a lot of deer-resistant summer blooming plants for shade, an annoying thing for those of us with plenty of it. Lenten roses have a very long bloom time, however. The other three blooming plants have exceptionally lovely flowers and are well worth planting. Ferns provide lovely greenery and texture. Autumn fern and tassel fern are evergreen, for an added bonus. For Sun: Use Abelia, butterfly bush, Chinese fringe bush, Gardenia, lilac, crepe myrtle, beautyberry, and spirea. That is an assortment that will take you from spring to fall, especially with the butterfly bush, Abelia, and crepe myrtle in the mix. And, yes, crepe myrtles can be shrubs thanks to some handy breeding. Eastern swallowtail butterflies adore Abelia while Gardenia and lilac provide delectable fragrance. For Shade: Try golden paperbush, Lily-of-the-Valley shrub (Pieris), Schipka laurel, and fragrant winter Daphne. Golden paperbush, one of our all-time favorites, is easy to grow and features an abundance of brilliant yellow, highly fragrant blooms in February and March. Pieris decks itself out in pendant clusters of white, lightly fragrant blooms that resemble lily-of-the-valley. Winter Daphne is evergreen and when mature produces many clusters of unbelievably fragrant flowers in February. Plant it and the Pieris where the soil drains well. For Sun: Plant crepe myrtle, Japanese snowbell, and magnolia (deciduous varieties for the most color.) Deciduous magnolias are among the earliest, and most splendid, trees to bloom with showy flowers in purple, pink, yellow, and white. Few trees can compete with the long blooming season, brilliant fall color, attractive bark, and handsome architecture of crepe myrtles, which are also low maintenance. Pro tip: do not “top” a crepe myrtle when pruning it. This is an outmoded practice of no benefit. For Shade: Red buckeye and dogwood are two standouts. Red buckeye is a handsome and unique tree with attractive foliage and spikes of red flowers that provide nectar to early hummingbirds. What would be a Southern garden without a dogwood? Beyond the lovely white-flowering varieties, pink and ruby-red cultivars are available as well. 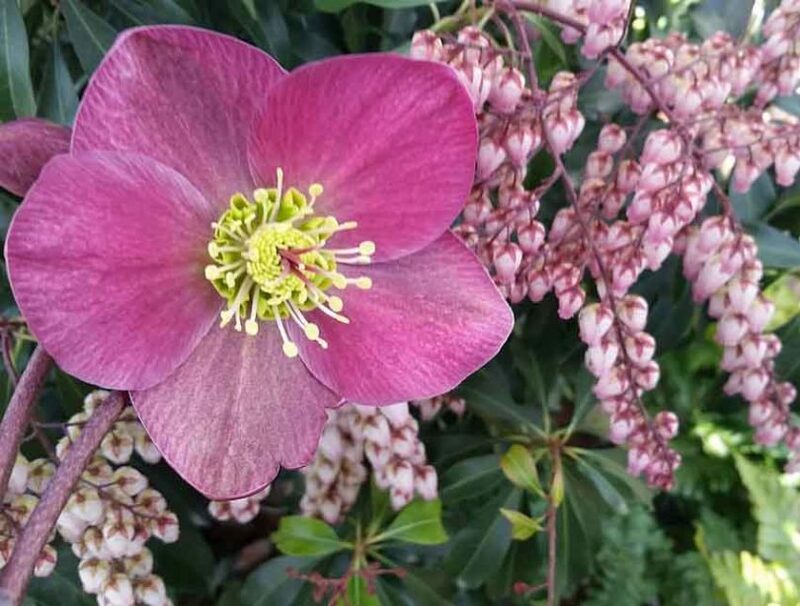 Featured image – Helleborus Mollys Red with pink Pieris / Homewood Nursery and Garden Center. Tina Mast is communications director for Homewood Nursery & Garden Center in Raleigh and can be reached at (919) 847-0117 or [email protected] For more deer resistant plant ideas, visit homewoodnursery.com.